"Your blood angel is great! What was your recipe for the metallics?" "hey Roman, I saw your awesome sanguinary garud and I just had a question what colors did you use for your NMM technique? I want to do my gaurd the same way"
Not easy, as it has been a lot of try and error during painting. First it is not NMM, these are True Metallic Metals. I did start him on a bright silver basecoat. Brought in light and shadows by glazing on the metallics with using Dark Sea Blue by Model Colour in the Metall colour mix and brought out the lights with a very bright silver tone by model air colour (this colour was by Raffa, as we did paint at his house - i did forget how it is named). 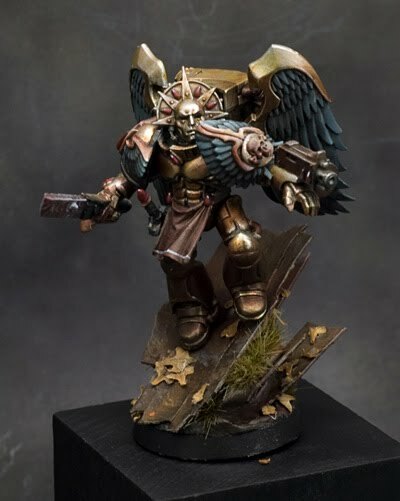 Then i had a silver Marine and thought wow... gold would look much better. Then i mixed Tamiya Clear Red with Tamyia Clear Yellow to get Tamyia Clear Orange and worked with thin glazes over the complete armour to bring back the golden spirit of these models. Did this several times, also i have mixed in some more red or shadow colours (Dark Sea Blue, Dark Green) in those glazes to bring in differences in the metals. Afterwards i have carefully reworked some of the lights by using the brightest metal tone. Wow! You wouldn't believe how many sleepless nights I had trying to figure out if it was metallics or nmm. That's how amazing it was. Im glad you put all that to rest and I'll be sure to try that out sometime. Thanks! what i wanted to say is: the silver color you´re refering to is probably Vallejo Air Color Chrome - got the bottle right in front of me. It´s one of the best silver colors i know, the Gold and light brass from that line are also quite nice, as they dry extremly smooth and bright. Hi, nice work. How did you do the wings?